Because volunteers can change the world, Libros Para Pueblos is looking for 6 enthusiastic teachers, librarians, or just amazing moms and dads to join a pilot volunteer project March 23-31, 2013, to work with the librarians in a few of our children’s lending libraries in remote villages. 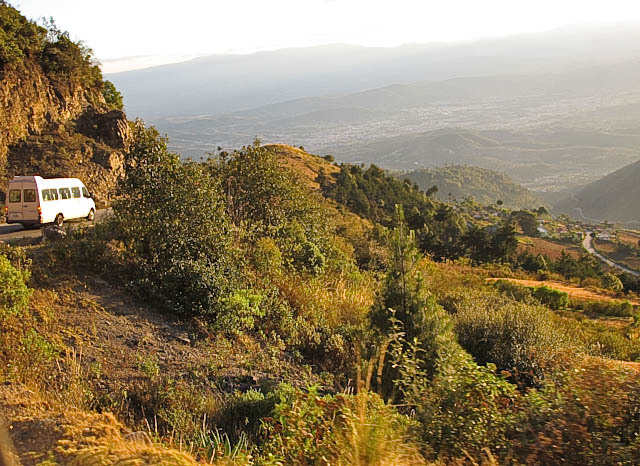 The participation fee of $1500 covers all costs of hotel, food, transportation, museum entrances, and lectures, plus includes a tax deductible donation to this seriously nonprofit organization, but not airfare to Oaxaca. 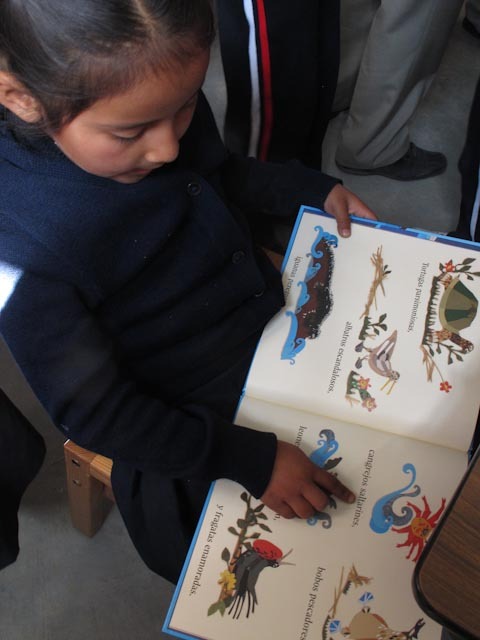 Many of the libraries are located in isolated indigenous villages whose second language is Spanish. This is an opportunity to contribute­­­ to the core heart of Mexico. We never leave a library without big smiles plastered on our faces. If you’re devoted to opening the doors to reading to children who need and appreciate it, please consider joining us. During this pre-Easter week in March, we will spend the first four days working long hours with the librarians, children and communities in three to five developing libraries, and the last three days soaking up the Easter pageantry in the colorful environs of Oaxaca. The work will be hand in hand with the librarian, drawing children into books through storytelling, readings, crafts, art, and song. If the libraries with the most need in March are far from Oaxaca, volunteers may stay in the library village Sunday through Tuesday, but they will never be alone. Either there will be two volunteers or a volunteer and an LPP representative with them. Please visit our website www.librosparapueblos.org, and then email me with any questions. This is going to be an amazing week and we need great advisors for this pilot program. Every teacher’s dream: a roomful of students gathered around tables, talking excitedly while waiting for the boxes to be opened. Boxes of books that they can hardly wait to read! Hurry up and open the box! 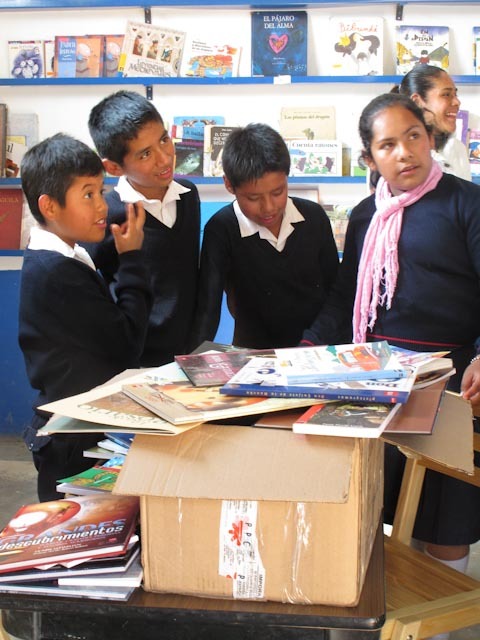 This is the scene of a book delivery at one of the more than 60 school libraries that have been established by the volunteers of Libros Para Pueblos in cooperation with the people of the villages. Each library belongs to and is successfully run by the people of the village where it is located. The people, who are proud of their ownership, are free to implement any of their own ideas or programs. Periodically LPP offers tours where participants help deliver new books to one of the existing libraries. The new books are added to keep interest growing and to keep up with increasing reading ability of the students. 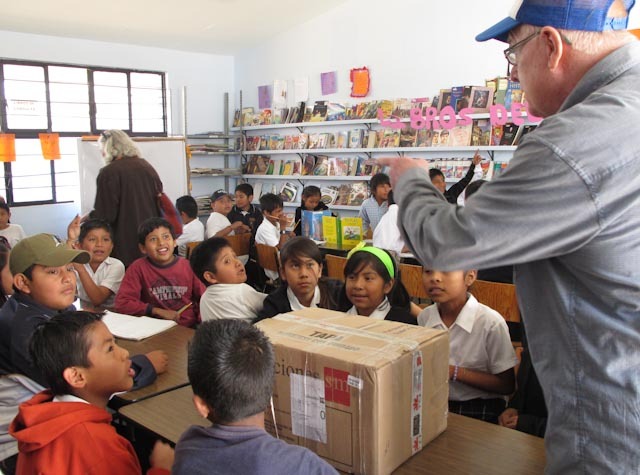 I recently attended a delivery tour to San Bartolo Coyotepec, and we all had a wonderful time handing books to enthusiastic children and then reading with them! This little girl read an entire book to me! LLP is partially supported by a Mexican family who generously committed to start at least one new library a month through the end of 2013. They also financially support a vision program and installation of computers. 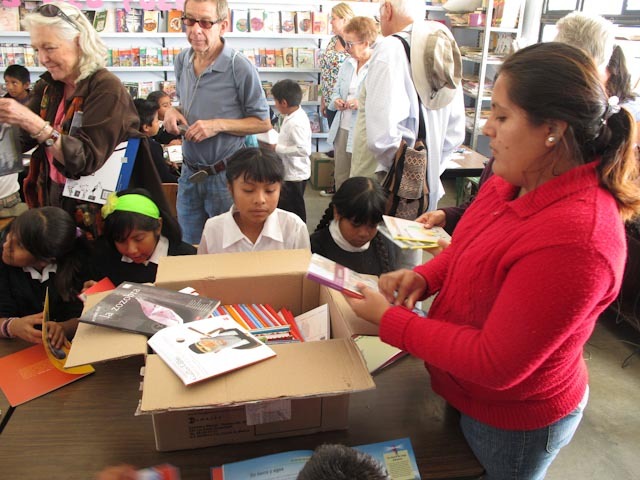 LLP is the largest purchaser of children’s books in the state of Oaxaca and thus receives excellent discounts from publishers. The cost for installing a new library of close to 400 quality books is about $3000 US. 100% of the funding comes from private donations, and they do not accept donations from any religious or political organizations. Books connect people to one another. A new book to read!